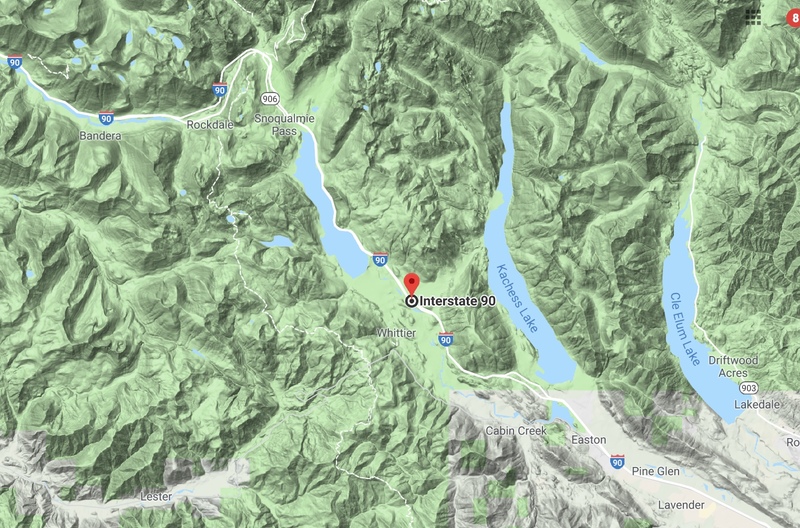 Last Friday morning, icy road conditions caused a series of accidents on both the eastbound and westbound lanes of I-90 near Snoqualmie pass, resulted in the closure of a crucial east-water transportation corridor for hours and one death. The fatal collision occurred when four tractor-trailers and a pick-up truck collided on eastbound I-90 around 5 AM near milepost 62, on the eastern side of the pass. As a result, the eastbound lanes were closed for 13 hours! The westbound accidents involved three semis and three cars near milepost 61 and closed the pass for 6 hours. The location of the accidents are shown in the map below (red marker at Milepost 62) Note that the accident site is about 10 miles east of Snoqualmie Pass in a relatively low area of the Yakima river drainage. Keep this in mind...it will be important. Roadway icing conditions were reported in the area. Let's explore why. The meteorology of the situation is no mystery. Cool, near freezing and subfreezing air over eastern Washington pushed up the Yakima Valley/ I-90 corridor to near Snoqualmie pass, while warmer air was aloft. A plot of the surface air temperatures (typically 2-meters above the surface) at the time of the accidents (around 5 AM), shows 31F in the area of the accident. And temperatures at the surface could have been a few degrees cooler than that. And near freezing temperatures were found down the valley towards Cle Elum. Temperatures were actually warmer above the valley, since cold air was trapped at lower elevations. What about precipitation? 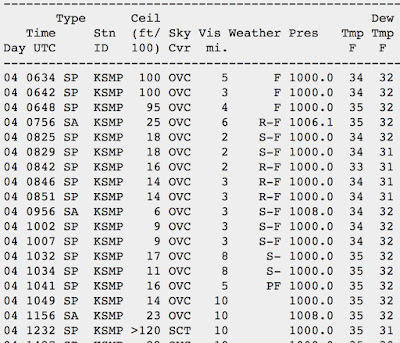 To get some insight into this, let's check out the nearby (but higher) Stampede Pass weather station, located at roughly 4000 ft (I-90 near the accident site was at about 2400 ft). It was dry at Stampede Pass until 10:48 PM (0634 UTC), followed by a wintry mix of rain, snow and ice pellets. Precipitation was over by 2:49 AM. Note that the air temperatures were a few degrees warmer at Stampede Pass than at I-90. Local weather radar is consistent with the Stampede Pass record and showed a band of precipitation moving through late the previous evening and during the early morning hours (see radar imagery below for 9:01 PM and 11:43 PM the night before). So we had freezing temperatures at the surface and precipitation falling into it, with an icy mixture of cold rain, snow, and ice pellets falling into the cool air near the surface. An obvious threat. Now, I would not be surprised that the drivers involved in these accidents were driving too fast for the conditions. But there is SO MUCH WSDOT (Washington Department of Transportation) could do that could help prevent such accidents, but to do so WSDOT needs to use weather data in a much more proactive way. For example, with temperatures below freezing on that roadway section and precipitation moving in, WSDOT could reduce the speed limit on that section (perhaps 35-40 mph). That can easily be done with the electronic signage installed along the freeway. Push people to slow down. Time and time again there are similar incidents with extensive accidents, loss of life, and extended periods of closing the pass when sudden inclement weather comes in. 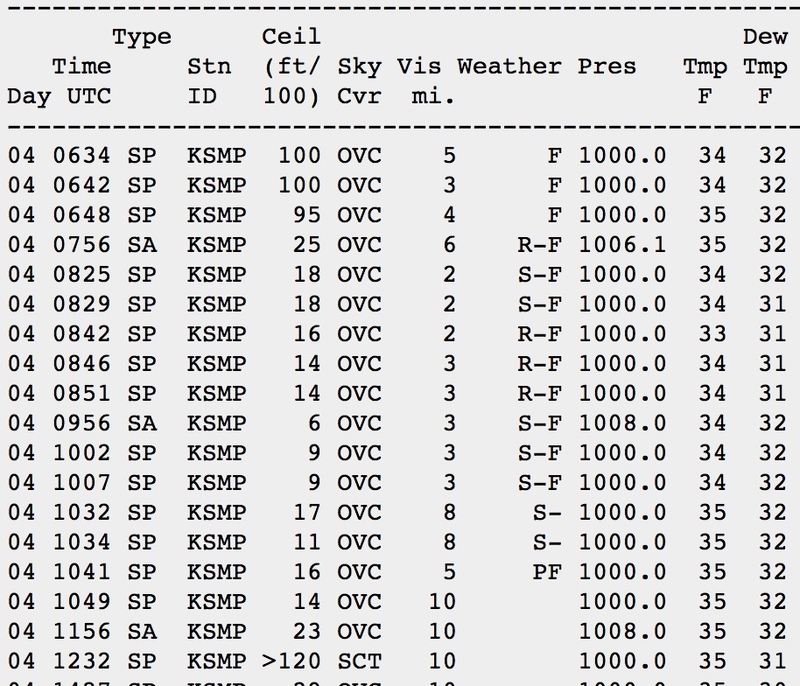 Weather conditions THAT ARE ENTIRELY FORESEEABLE with modern weather observations and modeling. 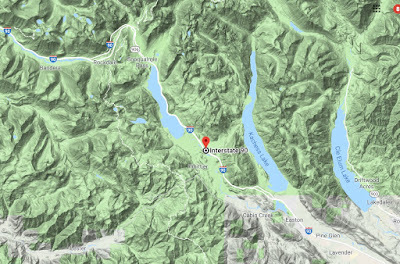 Another example is the situation on the western side of the Snoqualmie pass April 2nd of this year in which the pass was not only closed, but a pregnant woman and her unborn child were killed. This heavy snow event was caused by a predictable convergence zone and its evolution was clearly evident on weather radar. The speed limit could have been greatly reduced BEFORE the accident occurred, hopefully preventing it. And such predictable highway weather disasters are found all over the State, like the freezing rain that caused a Husky Band bus to overturn on the way to the Apple Cup. Pre-emptive actions to slow traffic and prevent accidents is critical, because once accidents start to occur, plowing becomes nearly impossible and the pass or roadway has to be closed for hours to clear up the mess, before the plows can go to work. In 1970, there were only a few dozen real-time weather observation locations in our state. Today, there are thousands. In 1970, weather forecast models had no ability to predict local weather. Today, we have extremely skillful high-resolution forecasts, some updated every hour. Today we have excellent weather satellite coverage, where there was nearly nothing available in 1970. Same with radar coverage. In 1970 it was difficult to communicate to folks on the road. Today, with electronic signage and smartphone apps, information can be transmitted in real time. Weather information and forecasts are now so skillful that WSDOT needs to change the way it does business: not reacting to weather situations but acting proactively. With a modest investment, WSDOT could build the capacity to access state-of-the-art weather information and forecasts to build warning systems that would save lives and radically reduce the number of pass closures. Speed limits could be reduced as a matter of course when inclement weather is imminent. And keep in mind that such a proactive system would not only save lives, but have major economic benefits, since pass/freeway closures are extraordinarily costly for our state, with losses of many millions of dollars per day when Snoqualmie pass is shuttered. Unfortunately, WSDOT management is not only NOT investing in such systems, it has been going in the wrong direction. 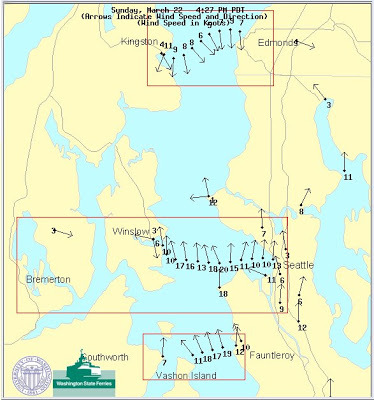 When offered such capabilities, they expressed little interest in using weather data in this new way, and recently dropped funding for the state-of-science weather communication tools they were supporting, like the I-90 and Ferry Weather pages shown below. Building a modern weather warning system for Washington State roadways would pay for itself in one event. Perhaps if Washington citizens let their elected officials and WSDOT management know that the current situation is not acceptable, better use of weather information on our roadway will occur. It is absurd that WSDOT is not considering using weather data analysis to help make traveling over Snoqualmie Pass safer for all of us. That should be their priority. As a high school AP statistics teacher, WSDOT's decision totally lacks any common sense in my opinion. Is there anyone at WSDOT citizens can contact to voice our displeasure about this? The state and WSDOT are statutorily required to build and maintain roads for very high levels of safety. Even so, it was only after several deaths (my son being one who barely survived) and lawsuits that WSDOT and then-Gov. Gregoire were forced to install a cement barrier between the N & S lanes of I-5 near Marysville to prevent median-crossover head-on collisions. It looks like WSDOT is still practicing cavalier disregard for the law in refusing to use the latest weather technology to increase safety over Snoqualmie Pass. This needs to be brought to the attention not only of the legislature, but of Gov. Inslee himself. I've used the I-90 traveler's information site many times before. If you are telling me it will be going away, please tell me who to contact at the State. I need to tell them that would be a very bad idea. All very good ideas.... but I wonder about the feasibility of spending a lot of money installing signage that drivers ignore. For instance, how many drivers pay any attention at all to the current electronically displayed variable speed limits on I-5 northbound just south of the Convention Center? Zero. How fast were the semi trucks going? Probably at or above the regular speed limits already. How many drivers respond to the current electronic signboard on I-90 before the pass? Pretty much none. Weather info is rather inconsequential if drivers don't use common sense and drive at at a safe speed.I drove eastbound in that same area during a snowstorm last January.I was going 40-45 mph in the right lane, and was astounded by the number of semis that were tailgating each other and blowing by me in the left lane going 60-65 mph. WSDOT isn't the problem. Idiot drivers are the problem. I guarantee you that even if WSDOT had done everything you recommend, this sequence of events would still have happened. These idiots would have simply ignored the warnings the way they ignore everything else that common sense would have told them about the road conditions they were driving through. I've been up on those passes too many times, and watched too many people drive faster than the posted limits and ignore everything. You can blame WSDOT all you like, but the fact is that the drivers themselves are responsible. Frankly, most west-side drivers and out-of-staters ought to be kept out of the mountain passes, simply because they're dangerous to themselves and others. I've been passed by idiots doing seventy miles an hour driving a semi down Blewett Pass when the conditions were such that I was afraid to go over thirty in an all-wheel drive rig with studs on all four tires. WSDOT cannot fix stupidity or the vast over-confidence that most of these dumbasses bring to the table. Short of banning them from mountain driving, there's really no solution to be had. WDOT could also have sprayed liquid de-icer in advance of the freezing condition to prevent development of ice in the first place. Is the cost of treatment more valuable than the loss of life? Cliff, you keep insisting on using rational common sense for your arguments. When are you going to realize that rational common sense doesn't work in the real world? You have to think of a way of convincing the WSDOT that installing this technology will somehow benefit THEM. It's a story as old as the hills. Ask any successful salesperson what really motivates people. Most drivers ego's have them believing they are in a race they must win at any cost. How are you going to convince them that slowing down will help them win that imaginary race? Answer.. you're not. I drive this section of road almost every weekend, twice, and concur with others: Folks drive too fast, esp semis. Temp speed reductions are ignored. Witnessed all types of bad and dangerous driving. I stay in the right lane and drive cautiously, so far have avoided trouble. Maybe driverless cars (and trucks) are a possible solution. Just a thought.... Hit the dangerous drivers where it hurts... An automated ticket system.... I have driven a Prius for 13 years. I have 1 speeding ticket... Yes... A speeding ticket in a Prius... ;) I was doing 28mph in a 20mph zone... I was "busted" by one of those automated cameras on Greenwood Ave. I had no idea until I got the ticket in the mail. How about installing a bunch of those in the typically dangerous areas. My father was killed in an icy car wreck very close to that area, so this topic hits home. Truck drivers go way too fast i drive over 80,000 miles a year in a large commercial van and routinely get passed by them going 75. No technology will change this, and using chemical deicer is a ridiculous and poor solution. Make incentives for better driving records as opposed to timely delivery, lower taxes on loads in reward. Same goes for every tax structure in this state reward companies for doing things right instead of penalizing everyone. There has been weather for the past two weeks and all us truckers and commercial drivers are well aware of the weather. But i am not paid hourly so i know the risks are not worth it. Unfortunately they accept them. "...pushed up the Yakima Valley/ I-90 corridor to near Snoqualmie pass..."
I'm not sure that the Yakima Valley is the best description of that area. Perhaps saying "the Upper Yakima rivershed" or "Cle Elum valley" would be more accurate? Or do you mean the Kittitas Valley? I guess I'm confused as to what you meant. There are dinosaurs in Washington State. For one thing, we need more trains and less semi-trucks. Truckers should be watched more closely by the cops! How often do you see a cop having pulled over a semi-truck? Almost never. Versus auto drivers who get pulled over all the time. Second, we need to spend money more wisely. Spending all the money on a tunnel to replace a road (in Seattle) we already have, and tearing up hwy. 527 from Bothell to Everett! 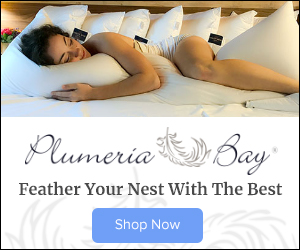 Instead we should be putting up barriers on down the center of the Aurora bridge and elsewhere, routing hwy 2 around those four towns west of Skykomish, and improving safety on I-90. Such bad funding allocation is the hallmark of our state. From my experience (NY State native who has driven in lots of ice and snow) it is the trucks that are the biggest problem. Second place goes to the stupid drivers who race through the pass with all season tires and 2 wheel drive. It is crazy how the trucks roar through the pass during icy and snowy conditions. Things get much much better when trucks are required to use chains and have to slow down to 30 mph or so due to the chains. Along with Cliff's recommendations here, there should be a strictly enforced 40 mph limit on trucks (with flashers on) any time the conditions are at all snowy or icy. In fact, a strictly enforced 40 mph limit on everyone when there is snow or ice would make things much safer. Again you hit the nail on the head. It is not a matter of not having the data, or the public supporting the collection of the data and supplying the taxes for the service. It is some kind of bureaucrat inertia that is causing lives? Why else? I thought this as accident after accident hammered I-5 South of Bellingham in a narrow area of precipitation in the foothill pass on Monday afternoon heading north. As drivers came down the hills where 60mph turns into 70mph towards Mt. Vernon, they hit this patch at 70+ mph. Cars and pick-ups spun out in the ditch median. I was forewarned by your forecast of the area that temperatures would drop precipitously as moisture near the surface froze in this inversion area surrounding the highway. You don't have to be high up. The foothills will sometimes do for icy conditions. WoW! Thank you Cliff Mass! In my local area, sadly, the WSDOT is diverting money away from badly needed Road resources and using that money to keep a recreational access Road cleared of snow, as well parking lots without sanitation facilities and recreational turnouts. For the last 2 years the WSDOT has been making every effort to keep a short section of the North Cascade Highway plowed, sanded and open from Early Winters near Mazama to the Silver Star Gate. I have written the Washington State DOT Concerning this issue. Its not right to divert much needed monetary resources away from Highways that carry children filled school busesnjust to clear a section of Highway 20 to the benefit of Back Country skier recreational access. Clearing that section of road to the Silver Star Gate also allows very easy access to Avalanche Terrain where I have observed children playing in The Delancey Ridge Avalanche slide paths where those paths cross the road. There's not even a warning sign at the Silver Star Gate that you are about to enter Avalanche Terrain. In the past that section of road has remained closed as greater amounts of snow fall. Typically and historically, snowmobilers and skiers using snowmobiles would have access to the closed hwy 20 at Early Winters. I should note that I am supporter of the hard-working folks that run the snow plows and other machines that help keep us safe. Those men and women deserve our respect and gratitude. However it is the administrative offices that decide how resources are allocated.Political concerns should not outweigh public safety concerns. My fear is one day we're going to have a serious accident on our local snow and ice covered State hwys and I'm going to have to ask why our tax dollars were diverted towards clearing a hwy for recreational use access and not used for the mandate of public safety. following this advice, wsdot would be closing the road for 70% of the winter. any casual observer knows that weather forecasts are highly variable and locally inaccurate. wsdot would be assaulted for closing the road while it's sunny and dry up there b/c of a forecast. 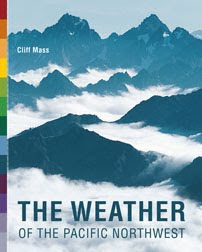 like all CM suggestions: we just need more $$$ for the weather prediction side of things. There is a disconnect between what DATA and INFORMATION says and what action a human brain decides to take. You can tell drivers all you want that something might be dangerous, and many will disregard that information, to their own detriment. Most cars have a real-time temperature gauge: mine blinks at me once it drops to 37 degrees as a way to indicate that the road surface might be icy. Electronic signboards exist and are usually ignored. More blinking signboards indicate that updated road conditions information is available on AM radio and I wonder how many drivers ever listen. A large percentage of drivers that strike pedestrians in marked sidewalks at a red light say "I didn't see them". There is a ever-expanding conversation in the avalanche awareness world that is all about the human factor- the fact that despite more and more data dumps and colored charts and recommendations and advisories that are available every year, people make consistently poor and contradictory decisions that result in avalanche burials and deaths. So, there is something about how our brains work that indicate that the presence of information alone does not result in appropriate action taken. We clearly are not rational creatures. Daniel Kahneman talks a lot about this in "Thinking Fast and Slow"
Furthermore, the more information that is provided, the more we seem to think that the responsibility for our choices and our safety belong to some government agency (ie driving over the speed limit despite the temperature gauge in the car and despite the obvious snow on the road and the obvious blinking signboards and the radio report). It's much easier to shift the blame. And, cars are often advertised as charging through deep snowbanks or filled with accident-preventing-features or shown blissfully floating down empty roads..... and it is all to easy to feel that 70 MPH is the default no matter what. I think this is a human heuristic problem, as much as I love more data. Historically, valleys were associated with the river flowing through them. The Yakima River flows through the Yakima Valley. The Green River flows through the Green River Valley. Cliff these are the same people that are replacing a six lane viaduct with exits to downtown with a four lane tunnel and some bike lanes. Good luck with anything sensible from WSDOT. It’s about kowtowing to the Seattle Progressive oligarchy. Be careful, they already want to reprimand you for your less than fully compliant stance on climate change. There should be a lot more electronic and camera road enforcement. That said, the fines should be a lot lower, the purpose is to foster safe roadways not as a profit center. Fines assessed against a particular license number should increase for 2nd 3rd, etc citations. Also citizens should be not only allowed but encouraged to request a judge to re-evaluate a ticket without having to appear in court. Does WA DOT have weather technicians on duty 24/7, and with authority to lower electronic speed signs? Thanks for raising this issue along with the relevant facts, Cliff. It's important. My heart goes out to those who have been injured or lost their lives in these locations--especially during the time the appropriate type of weather information has been available. I agree with mike heminger above. Cliff, what about the rate of false positives? You might scoff, but it won't take many of those for everyone to simply ignore the signs you want. Hell, WSDOT can't be bothered to paint visible lane markings and/or install reflectors on west-bound I-90, west of the summit. Imagine it's dark and raining and you're behind or next to a semi who is throwing off a firehose of water at your windshield, and you (and everyone around you) have no idea if you're in your lane or driving toward the cement barrier and the abyss beyond. I'm not exaggerating when I say it's a "white-knuckle" moment that lasts for 10 miles +/-. Pretty basic, but they can't even manage that. Agreeing with those who noted that more variable speed signage isn't going to affect real change. Drivers wantonly ignore what's already in place. Rather put those funds toward electronic/camera enforcement and, as Jeff aptly noted above, genuinely decent lane markings & reflectors. The manner in which WSDOT manages & spends is...questionable, at best. Re: your response "Historically, valleys were associated with the river flowing through them. The Yakima River flows through the Yakima Valley. The Green River flows through the Green River Valley." This is absolutely true. However, the Yakima Valley is a named valley much further away from the area he's writing about, over 100 miles to the south. So, in this instance, saying the air is being pushed up from the Yakima Valley sounds very strange, and makes one wonder why it would go from the Yakima Valley to the Pass while skipping the Kittitas Valley entirely. The confusion could be avoided by using the actual names of the valleys he's referring to, or by describing the area as the Upper Yakima Rivershed. Variable Speed Limit electronic signs have been in use on Snoqualmie Pass since the 1990s. WADOT provides radio alerts, online weather and alerts, and phone access to some of the same information. The weather information could be improved with more about wind, road temperatures, and temperature differences along the road in the below-freezing zone. Speed monitoring cameras were installed from Hyak east for several miles during road construction, which has been more or less conpleted (bringing great improvements in traffic flow and reduction in avalanche closures, but increasing the speeds at which people choose to drive). Certainly such cameras vould be used on an on-going basis.